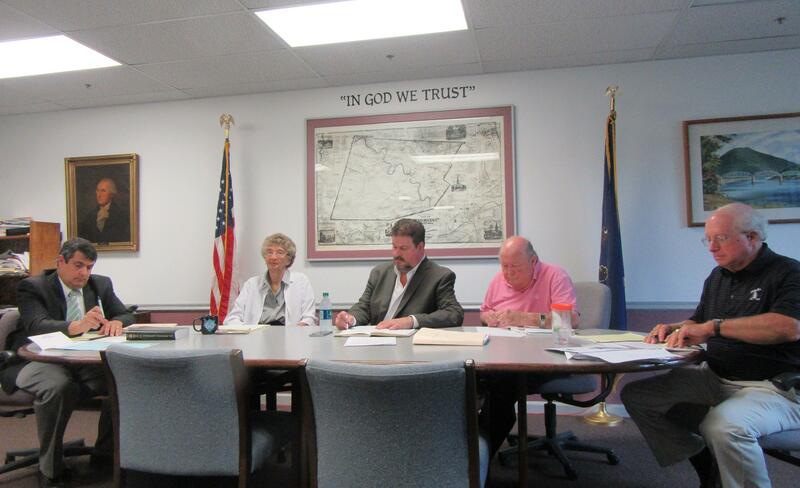 Wyoming County Commissioners (second from left) Judy Mead, Tom Henry, and Ron Williams, conducted their regular meeting at the courthouse in Tunkhannock on Tuesday with solicitor Atty. Paul Litwin (left) and chief clerk Bill Gaylord present. In addition to addressing a number of official agenda items on June 27, the Wyoming County Commissioners were asked what they believe can be done to increase awareness among county residents about a recent spike in drug overdoses – as many as six in one week. Celeste Kranick, Northeast Regional administrator of The Addict’s Mom and a member of Not One More in Wyoming County, blamed a recent increase in overdoses on tainted pills that are laced with Fentanyl. “The public isn’t aware of what’s going on,” she stated, adding that most overdoses are not being reported as such. Commissioner Tom Henry agreed that, while “overdose” is sometimes listed on the coroner’s report as the cause of death, more often a person is recorded as dying of a heart attack or respiratory distress. The general consensus is that families remain reluctant to publicly acknowledge that their loved ones died from a drug overdose. Likewise, a toxicology report is not always requested, so the statistics neither tell the whole story which could help officials justify the need for additional support and resources. Kranick then asked if any progress had been made at the county level on getting a dedicated hot line for people seeking help with an addiction or suffering an overdose. If not, she suggested, could the county fund the production of yard signs and/or billboards, like those in neighboring Bradford and Lackawanna counties, with at least the state-wide addiction hot line number 1-800-662-HELP. Commissioner Ron Williams encouraged Kranick to contact a supervisor at the barracks with the time and date of the occurrence and ask what happened. Kranick replied that the backlash that she gets on social media when she reports rashes of overdoses or warns of especially strong drugs being circulated makes her reluctant to be too aggressive with public and law enforcement officials. “I’m trying to stay professional,” she remarked, conceding that she can get frustrated to the point of losing her composure when she’s dealing with people who don’t share her understanding of the complexity of addiction and overdoses. Williams suggested that Kranick speak with Coroner Tom Kukuchka and find out what suggestions he might have about getting more reliable statistics out to the public to increase awareness. Kranick then asked what progress has been made at the county level at getting some sober houses and “drop in” centers operating, perhaps assisted by the new grant that will be administered by county Human Services Director Mike Donahue. At the moment, Henry related, the county is still dependent on seeking services through its partnership with Luzerne County, but that will change. Henry asked for patience, however, as the Human Services Department works its way through the current fiscal budget. On the topic of available spaces for a drop-in center, the commissioners said that space has been available, but it is currently being used for the Drug Treatment Court program. Williams reported that he had been in contact with Dennis Phillips of Trehab and that two homes have been opened in Susquehanna County that are also available for Wyoming County residents in need of a sober house. Lori Bennett, business office manager at Wyoming County Special Needs, noted that she attended two recent meetings conducted by Donahue at which the grant and its potential implications were discussed at length. Bennett was especially impressed by the willingness of Tunkhannock Area School District superintendent Heather McPherson to bring intervention programs into the classroom to reach students before they are exposed to dangerous drugs and potential addiction. Henry expressed the support of the commissioners at getting programs and speakers into the schools, noting, “Before, they wouldn’t let us in there.” He added that Wyoming County would be forming a new committee to help structure both funding and programs. Williams said that a recovery center for teens at EIHAB – the former St. Michael’s School – has begun admitting residents on a “pay” basis. The facility does not yet have clearance to take in teens who will be using insurance plans to cover the costs of their programs and boarding. The commissioners unanimously approved a renewal of the county’s contract with Trinity Services, the company that provides food at the Wyoming County Prison, noting that they are generally pleased with the results. “It took a while to get the jail to use the food the way that they were supposed to,” Henry remarked. The commissioners went back and forth before approving a request from PHARE (PA Housing and Rehabilitation Enhancement) to allow the agency to move some remaining funds from a 2012-14 project into a housing project currently underway in Nicholson. The commissioners could not recall the exact amount but said that it was less than $5,000. The board tabled the renewal of the county’s lease for Hollowcrest Corners, where the Conservation District, District Magistrate, and Penn State Extension have offices. After an executive session, it was announced that county solicitor Paul Litwin needed to verify some details before the contract could be signed.